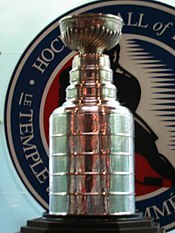 The 2010 Stanley Cup playoffs of the National Hockey League (NHL) began on April 14, 2010, after the 2009–10 NHL regular season. The Finals ended on June 9, 2010, with the Chicago Blackhawks defeating the Philadelphia Flyers in six games to win their fourth championship and their first since 1961. Blackhawks center and team captain Jonathan Toews was awarded the Conn Smythe Trophy as the playoffs' most valuable player. This NHL post-season was noted for the unexpected playoff successes of two teams: the Philadelphia Flyers and Montreal Canadiens, who were the seventh and eighth seeds in their conference and were tied for points. The Flyers became the third NHL team to win a seven-game series after being down 3–0 (the others being the 1942 Toronto Maple Leafs and the 1975 New York Islanders). The Flyers went on to play in the Stanley Cup Final, losing to Chicago. Meanwhile, the Canadiens became the first eighth-seeded team in NHL history to win a series against the first-seeded team after being down 3–1 in a series, when they beat the Washington Capitals in the first round. After upsetting the defending Cup champions Pittsburgh Penguins in the second round, the Canadiens became the first eighth-seeded team to compete in the Eastern Conference Finals since the current playoff format was implemented in 1994. Previously, only the eighth-seeded 2006 Edmonton Oilers had accomplished a similar feat, winning the 2006 Western Conference Finals. As a result of the Canadiens having the eighth seed, the Flyers became the first seventh-seed to have home-ice advantage in the conference finals since the current playoff format was instituted. During the 2010 playoffs, 18 games went to overtime. The Washington Capitals entered the playoffs as the Presidents' Trophy winner, earning the NHL's best regular season record with 121 points. The Montreal Canadiens qualified for the playoffs as the eighth seed with 88 points. This was the first and to date only playoff meeting between these two teams. The teams split this year's four-game regular season series. Montreal's point difference in the series was the fifth largest point differential (33 points) for a lower-seeded team beating a higher-seeded team in playoff history. It was also the first time an eighth-seeded team came back against a number one seed after being down 3–1 in the series. Montreal goaltender Jaroslav Halak made 45 saves and Tomas Plekanec won game one for the Canadiens with his goal 13:19 into the first overtime period. Washington forward Nicklas Backstrom scored the overtime winner in game two and completed a hat-trick with his goal 31 seconds into the first overtime period to give Washington a 6–5 win; Andrei Kostitsyn also scored a hat-trick during this game in a losing effort for the Canadiens. After a scoreless opening period in game three, the Capitals scored four times in the second period as they earned a 5–1 victory. Washington forward Alexander Ovechkin recorded three points as the Capitals won game four 6–3. Jaroslav Halak returned in game five for Montreal after sitting out the previous game and posted 37 saves as the Canadiens avoided elimination with a 2–1 win. Michael Cammalleri scored twice in the opening period of game six for Montreal and Jaroslav Halak made 53 saves as the Canadiens forced a seventh-game with a 4–1 victory. Montreal forward Dominic Moore scored the series-clinching goal late in the third period of game seven as the Canadiens hung on to a 2–1 decision. The New Jersey Devils entered the playoffs as the second overall seed in the Eastern Conference after winning the Atlantic Division with 103 points. The Philadelphia Flyers qualified as the seventh seed with 88 points, winning the tiebreaker over Montreal on total wins (41 to 39). This was the fifth playoff meeting between these two teams, with the teams splitting the four previous series. They last met in the 2004 Eastern Conference Quarterfinals where Philadelphia won in five games. Philadelphia won five of the six games during this year's regular season series. The Flyers upset the Devils in five games. Philadelphia goaltender Brian Boucher made 23 saves in game one as the Flyers took the opening game 2–1. Devils forward Dainius Zubrus broke the tie in game two with just over four minutes remaining in the game as New Jersey evened the series with 5–3 victory. Daniel Carcillo scored the overtime winner for the Flyers in a 3–2 win in game three. Brian Boucher made 30 saves and Jeff Carter added two goals in game four as the Flyers pushed New Jersey to the brink of elimination with a 4–1 triumph. Philadelphia ended the series in game five with a 3–0 shutout, Boucher made 28 saves in the victory. The Buffalo Sabres entered the playoffs as the third seed in the Eastern Conference after winning the Northeast Division with 100 points. The Boston Bruins earned the sixth seed with 91 points. The last meeting between the two franchises took place in the 1999 Eastern Conference Semifinal, which the Sabres won 4–2. The turning points in the series were the injury to Thomas Vanek in game two, the Sabres blowing a two-goal lead in game four and losing in double overtime, and the waiving of an automatic suspension against Bruins captain Zdeno Chara after game five. Pittsburgh's Bill Guerin plays in-front of the Senators net April 16. The Pittsburgh Penguins, the defending Stanley Cup champions, entered the playoffs as the fourth overall seed in the Eastern Conference with 101 points. The Ottawa Senators earned 94 points during the regular season to finish fifth overall in the Eastern Conference. This was the third meeting between the two clubs and third time in four years, all occurring during the Eastern Conference Quarterfinals, with Ottawa winning the series 4–1 in 2007, and Pittsburgh sweeping the series in 2008 (the Senators did not qualify for the playoffs in 2009). The San Jose Sharks entered the playoffs as the Western Conference regular season champions with 113 points. The Colorado Avalanche qualified as the eighth seed with 95 points. This was the fourth and most recent playoff meeting between these two teams with Colorado winning two of the previous three series. They last met in the 2004 Western Conference Semifinals where San Jose won in six games. San Jose won this year's four-game regular season series earning five of eight points. The Sharks eliminated the Avalanche in six games. Chris Stewart scored for the Avalanche in the final minute of game one as they took the opening game 2–1. Sharks forward Joe Pavelski tied game two in the final minute of regulation time before Devin Setoguchi scored the game-winner on the power-play 5:22 into the first overtime period; evening the series at one game each. Colorado goaltender Craig Anderson made 51 saves and Ryan O'Reilly was credited with scoring the overtime winner after San Jose defenceman Dan Boyle scored on his own goal as the Avalanche won game three 1–0. For the third consecutive time in the series overtime was required to solve game four as Joe Pavelski won the game for the Sharks with his goal 10:24 into the first overtime period. Evgeni Nabokov made 28 saves to earn a shutout as the Sharks easily won game five 5–0. After falling behind early in the third period of game six San Jose scored four unanswered goals to close out the series with a 5–2 victory. The Chicago Blackhawks entered the playoffs as the second overall seed in the Western Conference after winning the Central Division title with 112 points. The Nashville Predators qualified as the seventh seed with 100 points. This was the first playoff meeting between these two teams. Chicago won four of the six games during this year's regular season series. The Blackhawks defeated the Predators in six games. Nashville scored four times in the third period of game one to earn their franchise's first-ever road playoff victory; they had lost all of their ten previous playoff road games. Blackhawks goaltender Antti Niemi made 23 saves in a 2–0 shutout in game two, as Chicago evened the series. After trading goals in the opening period of game three, the Predators struck three times in the final 40 minutes including a penalty shot goal by Martin Erat. Antti Niemi earned his second shutout of the series in game four as Chicago took the game 3–0. The Blackhawks tied game five late in the third period on a short-handed goal by Patrick Kane and Marian Hossa ended the game 4:07 into overtime, ten seconds after he finished serving a major penalty for boarding. Chicago captain Jonathan Toews capped the scoring in the first period of game six; that saw the teams exchange seven goals. The Blackhawks held on to win the series-clinching game 5–3. The Vancouver Canucks entered the playoffs as the third overall seed in the Western Conference after winning the Northwest Division title with 103 points. The Los Angeles Kings qualified as the sixth seed with 101 points, earning their first playoff berth since 2002. This was the fourth playoff meeting between these two teams, with Los Angeles winning two of the three previous series. They last met in the 1993 Smythe Division Finals where Los Angeles won in six games. Vancouver won three of the four games during this year's regular season series. The Canucks eliminated the Kings in six games. Mikael Samuelsson scored twice for the Canucks in game one including the overtime winner 8:52 into the first overtime period as Vancouver took the opening game 3–2. The Kings evened the series in game two when Anze Kopitar scored the game-winning goal in the first overtime period at 7:28. Los Angeles chased Vancouver starter Roberto Luongo from game three after he allowed four goals against on sixteen shots, the Kings held on to win 5–3. Vancouver forward Henrik Sedin broke the tie in game four with 2:52 remaining in regulation time as the Canucks evened the series with a 6–4 victory. Mikael Samuelsson extended his goal scoring streak to five games as the Canucks easily won game five 7–2. Canucks goaltender Roberto Luongo made 30 saves in game six and Daniel Sedin scored the series-winner for Vancouver late in the third period of a 4–2 win. The Phoenix Coyotes entered the playoffs as the fourth seed in the Western Conference with 107 points. The Detroit Red Wings qualified as the fifth seed with 102 points. This was the third playoff meeting between these two teams, with Detroit winning both previous series. They last met in the 1998 Western Conference Quarterfinals where Detroit won in six games. Detroit won this year's four-game regular season series earning six of eight points. The Red Wings defeated the Coyotes in seven games. Phoenix went three for four on the power-play in game one as they took the opening game by a final score of 3–2. Red Wings forward Henrik Zetterberg scored a hat trick in game two as Detroit evened the series with a 7–4 win. Petr Prucha scored the game-winning goal for the Coyotes in game three as Phoenix took the game with a 4–2 victory. Detroit goaltender Jimmy Howard made 29 saves to shut out the Coyotes in game four as the Red Wings tied the series with a 3–0 win. The Red Wings broke the tie in game five just past the midway mark of the third period with two goals scored 70 seconds apart and held on to win 4–1. Phoenix forced a seventh game with a dominant special teams performance in game six recording three power-play goals in the victory. After a scoreless first period in game seven, the Red Wings scored four times in the second period en route to a 6–1 win. This was the second playoff meeting between these two teams, with Montreal winning the pervious series. They last met in the 1998 Eastern Conference Quarterfinals where Montreal won in six games. Pittsburgh won three of the four games during this year's four-game regular season series. The Canadiens defeated the Penguins in seven games. Pittsburgh scored four times on the power-play in game one as they took the opening game 6–3. Michael Cammalleri scored twice for Montreal in game two and Jaroslav Halak made 38 saves as the Canadiens evened the series with a 3–1 win. Pittsburgh forward Evgeni Malkin's fifth goal of the playoffs broke a scoreless tie in the third period of game three as the Penguins earned a 2–0 victory; Marc-Andre Fleury made 18 saves to shut-out the Canadiens. Jaroslav Halak made 33 saves for Montreal in game four as Montreal won the game 3–2. In game five, Penguins goaltender Marc-Andre Fleury made 32 saves in a 2–1 victory. Montreal forward Maxim Lapierre scored the game-winning goal in game six as the Canadiens won their fourth consecutive elimination game of the playoffs. Montreal's Brian Gionta scored twice on the power-play in game seven as the Canadiens eliminated the defending Stanley Cup champions with a 5–2 win. Game seven was the last game ever to be played at Mellon Arena, the Penguins' home rink since the start of the franchise as the Canadiens dethroned the defending Stanley Cup champion Penguins. Incidentally, the Canadiens were the winners of the first game played against the Penguins at Mellon Arena in 1967. The Penguins moved into the Consol Energy Center starting the next season. This was the fifth playoff meeting between these two teams, with the teams splitting the four previous series. They last met in the 1978 Stanley Cup Semifinals where Boston won in five games. The teams split this year's four-game regular season series, including a 2-1 overtime win by Boston at the 2010 NHL Winter Classic at Fenway Park on New Year's Day. Philadelphia became the third NHL team to come back from a 3–0 deficit to win a series, joining the 1942 Toronto Maple Leafs and the 1975 New York Islanders as the only teams to accomplish this feat (the Los Angeles Kings became the fourth team to do this in 2014). Bruins forward Marc Savard ended game one with his goal 13:52 into the first overtime period, giving Boston a 5–4 victory. Milan Lucic broke the tie late in the third period of game two to give the Bruins a 3–2 win. Boston goaltender Tuukka Rask made 34 saves in a 4–1 Bruins win during game three. In game four, Bruins forward Mark Recchi tied the game in the final minute of the third period, however, the Bruins came up short in overtime as Simon Gagne extended the series with a goal 14:40 into the first overtime period in a 5–4 Flyers victory. Brian Boucher and Michael Leighton made 23 saves in a 4–0 split shutout for the Flyers in game five; Boucher was injured in the second period and did not return to the game. The Flyers forced a seventh game with a 2–1 victory in game six. In game seven, Philadelphia came back from a 3–0 goal deficit to win by a score of 4–3. The Sharks and the Red Wings last faced off in the 2007 Western Conference Semifinals, which Detroit won 4–2. There have been two other series between these franchises in the mid-1990s, with each team winning one. Johan Franzen scored four goals in Game 4, the only victory in this series for Detroit. No player would do that in another playoff game until Jean-Gabriel Pageau scored four goals for the Ottawa Senators in a 6–5 overtime victory in game two of the 2017 Eastern Conference Second Round series against the New York Rangers. This was the fourth playoff meeting between these two teams, with Chicago winning two of the three previous series. They last met in the previous year during the Conference Semifinals where Chicago won in six games. The teams split this year's four-game regular season series. The Blackhawks defeated the Canucks in six games for the second consecutive year in the second round. Five different Vancouver players scored in game one and Roberto Luongo made 36 saves in the opening game victory. Kris Versteeg's first goal of the playoffs broke the tie in game two with 1:30 remaining in regulation time as the Blackhawks evened the series with a 4–2 win. Chicago forward Dustin Byfuglien scored a hat trick in game three as the Blackhawks won 5–2. In game four Blackhawks captain Jonathan Toews recorded a hat trick of his own (scoring all three goals on the power-play) as Chicago broke the game open in the second period and won by a final score of 7–4. Kevin Bieksa scored twice for the Canucks in game five as Vancouver avoided elimination with a 4–1 victory. After a scoreless opening period in game six the Blackhawks struck three times in the second period and held on to win the game 5–1, earning their second consecutive trip to the Western Conference Finals. This was the first ever conference final contested by the seventh and eighth seeds. The Canadiens and the Flyers both earned 88 points in the regular season, but Philadelphia's greater number of victories gave them the higher seed. There were five previous meetings between Montreal and Philadelphia, including the 1976 Stanley Cup Finals. Their last meeting was in the 2008 Eastern Conference Semifinals which Philadelphia won 4–1. This was the first ever playoff series between the Sharks and the Blackhawks. There were four games between these two teams during the regular season, with Chicago leading San Jose 3-1. The winner of this series has home-ice advantage in 2010 Stanley Cup Final. This was the only sweep of the entire playoffs. This was the second playoff series between these two teams and the first since 1971 when the Blackhawks swept the Flyers in four games in the Stanley Cup quarterfinals. Philadelphia won the only meeting between these teams in the regular season. Prior to the 2010 Finals, both teams had previously lost in their last five consecutive Finals appearances (Chicago in 1962, 1965, 1971, 1973, and 1992; and Philadelphia in 1976, 1980, 1985, 1987, and 1997). Having lost in the 2010 Finals, the Flyers became the third team in NHL history to lose in six consecutive Finals appearances, after the Toronto Maple Leafs and the Detroit Red Wings. It also was the first time since the Flyers themselves lost in 1987 that a team in the city of Philadelphia lost a championship in a non-presidential inauguration year (Phillies in 1993 and 2009 World Series, Eagles in Super Bowl XXXIX in 2005, Flyers in 1997, and 76ers in 2001 NBA Finals). This was the first Stanley Cup won in overtime since the New Jersey Devils in 2000. These are the top ten skaters based on points. If the list exceeds ten skaters because of a tie in points, goals take precedence. This is a combined table of the top five goaltenders based on goals against average and the top five goaltenders based on save percentage with at least 420 minutes played. The table is sorted by GAA, and the criteria for inclusion are bolded. ^ "2010 Stanley Cup Playoffs Quarterfinals Schedule". National Hockey League. April 11, 2010. Retrieved June 1, 2010. ^ a b Compton, Brian (May 14, 2010). "Double comeback: Flyers rally in Game 7 to advance". Boston: National Hockey League. Retrieved June 1, 2010. ^ a b "Questions galore for Capitals after quick exit". Washington, D.C.: National Hockey League. Associated Press. April 29, 2010. Retrieved June 1, 2010. ^ "Canadiens stun Penguins 5-2 in Game 7". National Hockey League. May 13, 2010. Retrieved June 1, 2010. ^ "Pittsburgh Penguins 1967-68 Game Log and Scores". Nhlreference.com. Retrieved May 26, 2014. ^ Ulman, Howard (May 14, 2010). "Flyers complete shocking comeback". Toronto Star. Boston. Associated Press. Retrieved May 15, 2010. ^ Warren, Ken (June 2, 2010). "Two cities that could use a CUP". Ottawa Citizen. p. B3. ^ "2009–2010 - Playoffs - All Skaters - Summary - Total points". NHL.com. Archived from the original on July 25, 2010. Retrieved May 1, 2010. ^ "2009–2010 - Playoffs - Goalie - Summary - Goals against average". NHL.com. Retrieved April 15, 2010. ^ "2009–2010 - Playoffs - Goalie - Summary - Save percentage". NHL.com. Retrieved April 15, 2010. This page was last edited on 28 March 2019, at 17:32 (UTC).